Can you work out the cause of this DVT? Home Can you work out the cause of this DVT? Chris Tennuci and colleagues present an interesting case of DVT. Can you guess the aetiology? A 35 year old female of Asian ethnicity presented with left lower limb swelling and discomfort of her left lower leg. She had a two week-old fracture of her second left metatarsal which was immobilised and placed in a backslab. She had a past medical history of polycystic kidney disease, hypertension and was currently taking perindopril and the combined oral contraceptive pill. She had a family history of polycystic kidneys and works as a secretary. Investigations (CT Abdomen + Pelvis, post-contrast systemic venous phase) showed an extensive thrombus in her left external and internal iliac veins, common and superficial femoral and popliteal veins with extension into the calf veins. The inferior vena cava was patent. She also had blood taken for a prothrombotic screen, full blood count, urea and electrolytes and liver function tests. The patient was admitted and intravenous heparin was commenced. In the operating theatre, an inferior vena cava filter was placed via a right common femoral approach. The patient was then positioned in the prone position. A 6 Fr sheath was placed under ultrasound guidance into the thrombosed popliteal vein. The thrombus was crossed with a glidewire and glidecatheter. 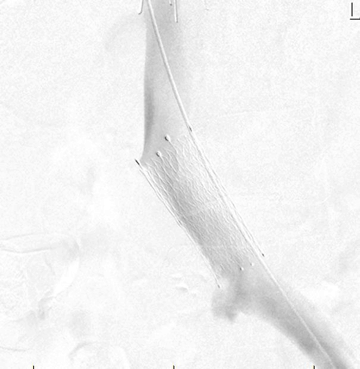 A venogram was performed. The glidecatheter was exchanged to the Solent™ Omni catheter. 500 000U Urokinase was power pulsed into the extensive thrombus and this was left for 30 minutes. After this time, thrombectomy was performed using the Angiojet System (Boston Scientific). Following this procedure, a venogram was performed which demonstrated a patent left iliofemoral system, but compression of her left proximal common iliac vein (figure 1). Post operatively, the patient was commenced on a novel oral anticoagulant. Her left lower limb swelling resolved over the course of two days. This was clinically suspicious of May-Thurner Syndrome. 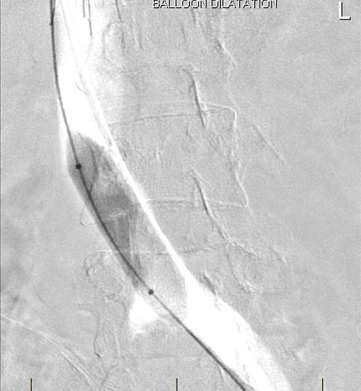 A left common iliac venous stent was subsequently placed (figure 3). Completion venogram demonstrates widely patent iliofemoral system with good outflow into the inferior vena cava. May-Thurner Syndrome, also known as iliac vein compression syndrome, was first described anatomically by May and Thurner in 1956 as a spur-like formation of the left common iliac vein in 22% of autopsies1. They believed this was formed as a result of the chronic pulsations of the overriding right iliac artery, leading to chronic trauma of the common iliac vein wall therefore causing local intimal proliferation, reduced venous return and chronic venous obstruction2. They concluded these changes were the factors causing a left-sided deep venous thrombus (DVT) formation. May-Thurner Syndrome is defined as a >50% luminal constriction of the left common iliac vein, with an incidence of 18%–49% 3 and a female:male incidence of 3:1. It occurs most commonly in the second to fourth decades of life usually presenting with left lower limb swelling, pain, varicosities, venous stasis changes or DVT4 and is the concluding diagnosis in 2-5% of patients with a left lower limb DVT5. Surgical approaches and endovascular interventions have been effective in the acute phase of the disease and endovascular venous stents can resolve the manifestations of chronic venous compression. In the acute phase, catheter-directed thrombolysis is accepted as the most appropriate treatment, which can be complemented by the use of a device to disrupt the venous clot, such as the Angiojet. Long-term, anticoagulation alone is ineffective and a consensus regarding the usage and duration of antiplatelet and antithrombotic therapy has not been established5. Angiojet is proprietary product that pharmacomechanically removes clot6. It involves a catheter over the wire technique where a wire is place over the length of the occluded vessel. The catheter is threaded over the wire and can deliver pressurised saline or thrombolytics to disrupt the clot. After an appropriate dwell time the clot is the aspirated via the catheter. To prevent embolisation a caval filter can be deployed prior to the procedure though the risk of pulmonary embolism appears to be low7. Given the mechanical aspect of the device there is an element of haemolysis which can manifest with arrhythmia, blood pressure changes and commonly haematuria due to haemaglobinuria. Patients are anti-coagulated during the procedure and post procedure, though duration of anticoagulation will likely be modified due to clot burden and predisposing factors. There is a paucity of evidence to guide the use of these techniques and as to the relative benefits. Those most likely to benefit are those with iliofemoral DVT, symptoms for less than 14 days, low risk of bleeding and good functional status8. There is some evidence for decreased post thrombotic syndrome symptoms but none that shows lower mortality or rates of PE9. 1) May R, Thurner J. The cause of the predominantly sinistral occurrence of thrombosis of the pelvic veins. Angiology, 1957: 8:419-427. 2) Oğuzkurt L, Ozkan U, Tercan F, Koç Z. Ultrasonographic diagnosis of iliac vein compression (May-Thurner) syndrome. Diagn Interv Radiol. 2007: Sep:13(3):152-5. 4) Wael I, Zakareya S, Hosam H. Wael AZ. Endovascular Management of May-Thurner Syndrome MS Ann Vasc Dis. 2012: 5(2): 217–221. 5) Fernando RR, Koranne P, Schneider D, Fuentes F. May-Thurner Syndrome in a 68-Year-Old Woman after Remote Abdominal Surgery. Tex Heart Inst J. 2013: 40(1): 82–87. 8) Antithrombotic Therapy for VTE Disease – Antithrombotic Therapy and Prevention of Thrombosis, 9th ed: American College of Chest Physicians Evidence-Based Clinical Practice Guidelines. Chest. 2012: 141(2 Suppl): e419S–e494S.